This week I am delighted to welcome Julie Stock back to my blog. Julie is the indie-published author of the contemporary romance From Here To Nashville. February 16th is the first anniversary of publication. Julie joins me to look back over an exciting year and to share what she has learned. Julie, welcome. Share a special memory from publication day. "I had three times the normal number of shares and retweets. Three times! I was overwhelmed by the support I received from the blogging community on Twitter, from my Facebook Author Page and from friends, new and old. It was great to learn how supportive my online community is, and quite humbling, I have to say." The cover is terrific - so stylish. What went through your mind when you first saw it? Thank you! It has had some wonderful feedback and I was and still am so proud of it. It had taken a while to get what I was looking for, so when the final cover came back from the designers, I was delighted with it, especially the colours. 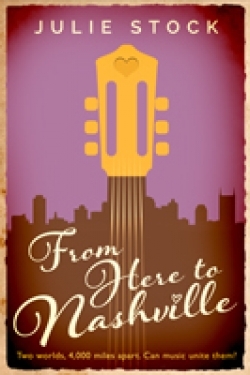 I love the font choice as well and the way the guitar blends into the Nashville skyline. I love seeing it on my timeline or on other people's when they share it. I will always be glad that my first book had such a wonderful, striking cover. A highlight from the virtual world has been the number of interviews and guest blogs I have been asked to write or take part in. I have made friends in far-flung places and it has been truly wonderful. A friend in canada, Tracey Weller, has just interviewed me on Skype and this video interview will come out around the date of From Here To Nashville's anniversary. It was amazing to speak to someone I have only ever talked to online and to feel like I have known her all my life. Although the interview itself isn't very long, we talked for hours! I think it's wonderful when you can use social media to such good effect. ....and from the real world. 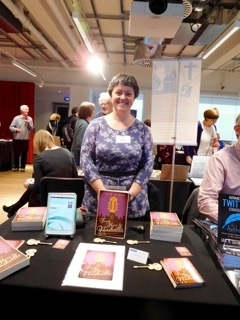 I attended an Indie Author Fair at Foyles in April, run by the Alliance of Independent Authors. This was the first time I had put myself out there in front of readers and it was a real pleasure to talk to people and sign my books for them. 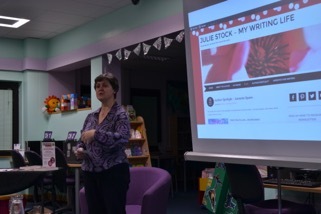 Late last year, I gave my first Library Talk and felt much the same about being able to stand in front of readers and tell them about my journey to self-publication. A year older, and a year wiser? Is there anything you didn't know a year ago that you will be apply to your second novel? I have learnt so many things. For example, it's easy to get your ebook and paperback copies ready to launch at the same time and to organise your covers for the different versions at the same time, too. It's also important to start marketing your book early to potential reviewers and the press. I didn't do a press release last time (too scared!) but I know how to do one now and would definitely do that at book launch time next time round. At the moment, I don't know if I'll self-publish again, but these are the things that stand out for me. How will you celebrate From Here To Nashville's birthday on February 16th? Well, I have set up a Thunderclap campaign to run on Twitter and Facebook. This involves people signing up to send out on their social media a message I've written. The messages all go out at the same time. The link is here: Thunderclap. I'm trying to encourage 100 people to sign up, but it's proving harder than I thought! But if it reaches 100, the message will go out all across Twitter and Facebook at the same time on For Here To Nashville'e birthday. Apart from that, I'm guesting on Tracey's blog by video(!) and on yours. It is especially nice to visit these two blogs again as I made friends with both of you on Twitter and have been so grateful for your continued support. Thanks, Jen for your good wishes. They are great questions, aren't they? As you say, it is good to reflect back on things and to learn as you move forward. Wishing you all the best with your writing too. Thank you for your comments, Jen. It's always a pleasure to hear from you. I think that Julie's experiences are of interest to writers in general, regardless of how they are published. Thanks for saying I asked good questions! Happy first book birthday, Julie. An interesting interview for all writers, indie and traditionally published. It's so important to reflect on learning, and thanks to Susanna for asking such good questions! I was especially interested in your comments about cover design. Wishing you all the very best as you continue on your writing journey. Thanks for reading and for your kind comment, Jan. It has been a lovely week already and I have been asked to appear on some other blogs since I wrote this post for Sue so all in all, a very good celebration. Thanks for your good wishes, Jan. I'm sure Julie will be delighted. Hi Luccia, Nice to see you here and thanks for reading. It's important to celebrate your book birthday, I think as a reminder to yourself of all you've achieved. So well done to you and if I can help you celebrate when you get there, let me know! Hi, Luccia. I'm glad Julie's book-birthday has inspired you. Thanks for dropping by.